Investor overconfidence can lead to excessive or active trading, which can cause underperformance. In a 1999 study, the least active traders had annual portfolio return of 18.5%, versus the 11.4% return that the most active traders experienced. Fear of loss. When asked to choose between receiving $900 or taking a 90% chance of winning $1000, most people avoid the risk and take the $900. This is despite the fact that the expected outcome is the same in both cases. However, if choosing between losing $900 and take a 90% chance of losing $1000, most people would prefer the second option (with the 90% chance of losing $1000). Familiarity Bias. Investors prefer to invest in "familiar" investments of their own country, region, state, or company. Although the best practice is for portfolios to hold at least 300 stocks, the average investor only holds three or four. Gambler’s Fallacy. When asked to choose which is more likely to occur when a coin is tossed—HHHTTT or HTHTTH—most people erroneously believe that the second sequence is more likely. The human mind seeks patterns and is quick to perceive causality in events. Attention Bias. A 2006 study posits that individual investors are more likely to buy rather than sell those stocks that catch their attention. For example, when Maria Bartiromo mentions a stock during the Midday Call on CNBC, volume in the stock increases nearly fivefold minutes after the mention. International differences in loss aversion. 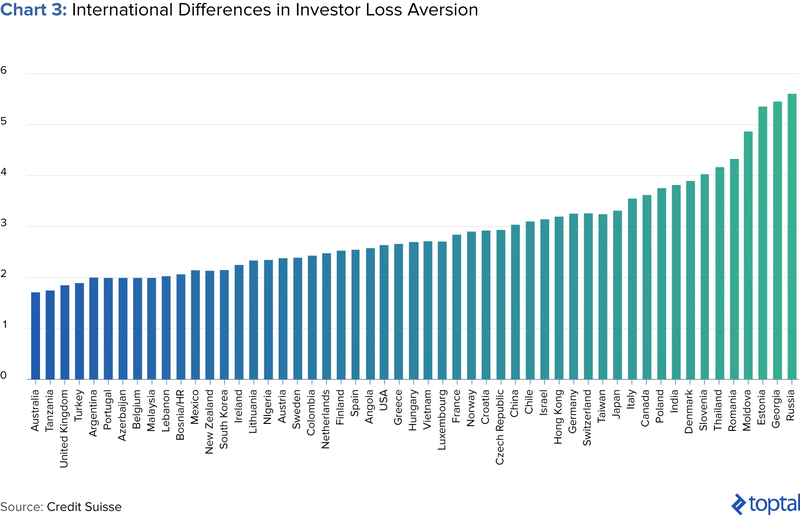 After controlling for factors such as national wealth and growth, a study found that Anglo-Saxon countries are the most tolerant of loss, while investors in eastern Europe have the greatest loss aversion. International differences in investor patience. 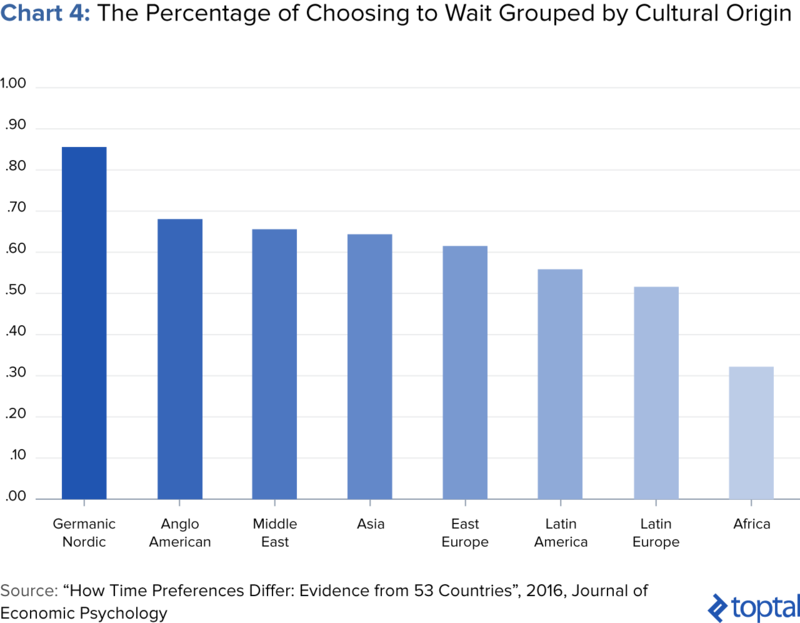 The same study found that investors from Germanic/Nordic countries (85%), Anglo/American countries, Asia (66-68%), and Middle East cultures are more willing to wait. 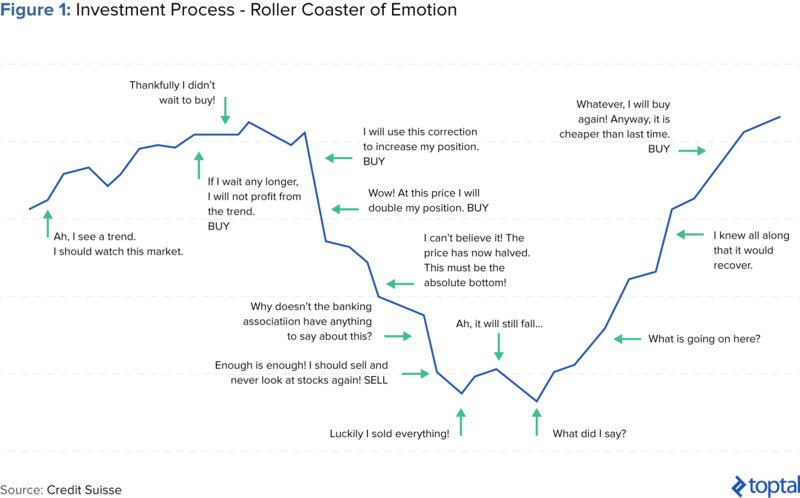 In the investment process, investors often experience the “roller coaster of emotions” illustrated below. Does this look or feel familiar to you? If so, you’re not alone. After all, the cyclical investment process, which includes information procurement, stock picking, holding, and selling investments, followed by making a new selection, is full of psychological pitfalls. However, only by becoming aware of and actively avoiding behavioral biases can investors reach impartial decisions. The emerging field of behavioral finance aims to shed light on true financial behavior. This piece outlines the aims of behavioral finance, the various cognitive and emotional biases investors often fall prey to, the tangible consequences these biases may lead to, and how cultural influences can affect investment decision-making. Established economic and financial theory posits that individuals are well-informed and consistent in their decision-making. It holds that investors are “rational,” which means two things. First, that when individuals receive new information, they update their beliefs correctly. Second, individuals then make choices that are normatively acceptable. While this framework is appealingly simple, it’s clear that in reality, humans do not act rationally. In fact, humans often act irrationally–in counterproductive, systematic patterns. 80% of individual investors and 30% of institutional investors are more inertial than logical. These deviations from theoretical predictions have paved the way for behavioral finance. Behavioral finance focuses on the cognitive and emotional aspects of investing, drawing on psychology, sociology, and even biology to investigate true financial behavior. We all have strongly-ingrained biases that exist deep within our psyche. While they can serve us well in our day-to-day lives, they can have the opposite effect with investing. Investing behavioral biases encompass both cognitive and emotional biases. While cognitive biases stem from statistical, information processing, or memory errors, an emotional bias stems from impulse or intuition and results in action based on feelings instead of facts. In general, humans tend to view the world positively. Outside of finance, in a 1980 study, 70-80% of drivers reported themselves to be in the safer half of the distribution. Multiple studies – of doctors, lawyers, students, CEOs – have also found these individuals to have unrealistically positive self-evaluations and overestimations of contributions to past positive outcomes. While confidence can be a valuable trait, it can also lead to biased investing decisions. Overconfidence is an emotional bias. Overconfident investors believe they have more control over their investments than they truly do. Since investing involves complex forecasts of the future, overconfident investors may overestimate their abilities to identify successful investments. In fact, experts often overestimate their own abilities more than the average person does. In a 1998 study, affluent investors indicated that their own stock-picking skills were critical to portfolio performance. In reality, they had overlooked broader influences on performance. At its most extreme, an overconfident investor can become involved in investment fraud. Economist Steven Pressman identifies overconfidence as the primary culprit responsible for the susceptibility of investors to financial fraud. Self-attribution bias occurs when investors attribute successful outcomes to their own actions and bad outcomes to external factors. This bias is often exhibited as a means of self-protection or self-enhancement. Investors with self-attribution bias may become overconfident, which can lead to underperformance. To mitigate these effects, investors should track personal mistakes and successes and develop accountability mechanisms. In many studies, it has been shown that traders who trade excessively (active traders) actually underperform the market. In a study conducted by Professors Brad Barber and Terrance Odean, investors utilizing traditional brokers (communicating via telephone) achieved better results than online traders who trade more actively and speculatively. In another of their studies Barber and Odean analyzed 78,000 U.S. household investors with accounts at the same retail brokerage house. After segmenting the group into quintiles by monthly turnover rates in their common stock portfolio, they found that active traders earned the lowest returns (see table below). They found investor overconfidence to be an important motivation for active trading. Established financial efficient market theory holds that there is a direct relationship and trade-off between risk and return. The higher the risk associated with an investment, the greater the return. The theory assumes that investors seek the highest return for the level of risk they are willing and able to take on. Behavioral finance and related research seem to indicate otherwise. 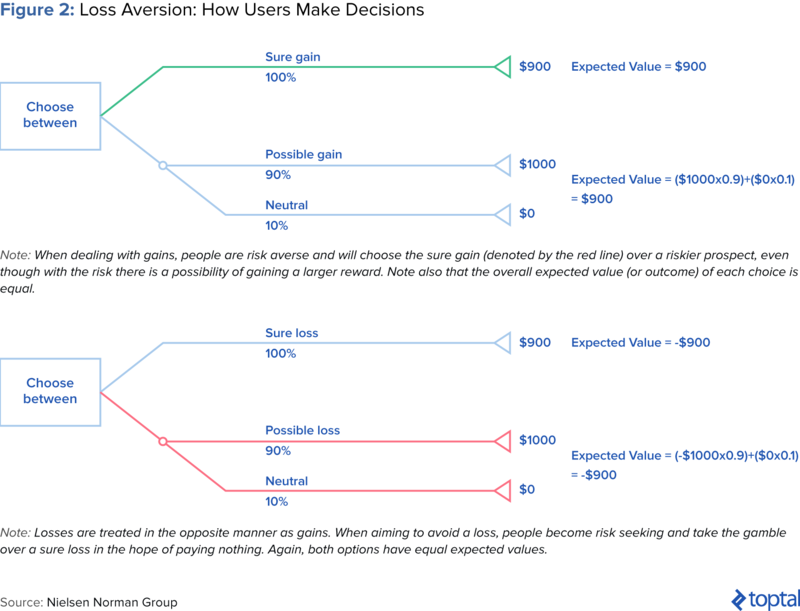 In their seminal study “Prospect Theory: An Analysis of Decision under Risk,” behavioral finance pioneers Dan Kahneman and Amos Taversky found that investors are more sensitive to loss than to risk and possible return. 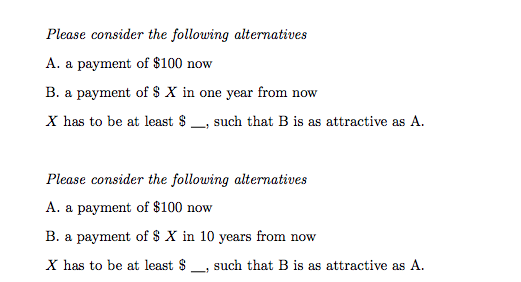 In short, people prefer to avoid loss over acquiring an equivalent gain: It’s better not to lose $10 than to find $10. Some estimates suggest people weigh losses more than twice as heavily as potential gains. Even though the likelihood of a costly event may be miniscule, people would rather agree to a smaller, sure loss than risk a large expense. For example, when asked to choose between receiving $900 or taking a 90% chance of winning $1000 (and a 10% chance of winning nothing), most people avoid the risk and take the $900. This is despite the fact that the expected outcome is the same in both cases. However, if choosing between losing $900 and take a 90% chance of losing $1000, most people would prefer the second option (with the 90% chance of losing $1000) and thus engage in the risk-seeking behavior in hopes of avoiding the loss. As a result of their fear of loss, investors often hesitate to realize their losses and hold stocks for too long hoping for a recovery. This “disposition effect,” coined in a 1985 study by economists Hersh Shefrin and Meir Statman, is the tendency of investors to sell winning positions and hold onto losing positions. The effect can increase investors’ capital gains taxes to be paid, the regulations of which incentivize investors to defer gains as long as possible. For investment professionals and wealth advisors, risk of loss will remain important for clients. However, you must remind clients that “loss” is a relative term, and that you can help them find an appropriate reference point from which a gain or loss will be calculated. According to the modern portfolio theory, as developed by Nobel Prize winning economist Harry Markowitz, an investment should not be evaluated alone, but rather by how it affects the portfolio as a whole. Rather than focusing on individual securities, investors should consider wealth more broadly. In practice, however, investors tend to become hyper-focused on specific investments or investment classes. These “narrow” frames tend to increase investor sensitivity to loss. However, by evaluating investments and performance with a “wide” frame, investors exhibit a greater tendency to accept short-term losses and their effects. The human psyche tends to bucket or categorize types of expenses or investments mentally. These buckets could include a “school fees” or “retirement,” and different accounts often hold different risk tolerances. Oftentimes, mental accounting leads people to violate traditional economic principles. Consider this example from UChicago’s Richard Thaler: Mr. and Mrs. L went on a fishing trip in the northwest and caught some salmon. They packed the fish and sent it home on an airline, but the fish were lost in transit. They received $300 from the airline. The couple take the money, go out to dinner, and spend $225. They had never spent that much at a restaurant before. According to Thaler, this example violates the principle of fungibility in that money is not supposed to have labels attached to it. The extravagant dinner would not have occurred had their collective salary increased by $300. Yet the couple still went because the $300 was put into both “windfall gain” and “food” accounts. 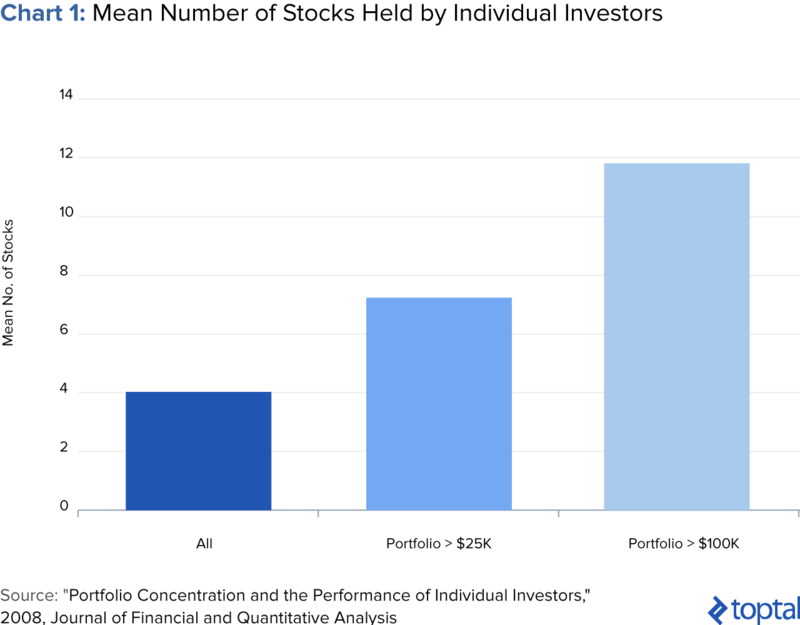 Investors tend to focus less on the relationship between investments and more on individual buckets, not thinking broadly about their overall wealth positions. Despite obvious gains from diversification, investors prefer “familiar” investments of their own country, region, state, or company. In a study, Columbia Business School professor Gur Huberman found that in 49 out of 50 states, investors are more likely to hold shares of their local Regional Bell Operating Company (RBOC)—regional telephone companies—than of any other RBOC. Investors also prefer domestic investments over international investments. In a study conducted by professors Norman Strong and Xinzhong Xu, the professors investigated this “equity home bias.” They argue that, by itself, investors’ relative optimism about the home market cannot fully account for equity home bias. Beyond a geographic familiarity bias, investors also exhibit strong preferences for investing in their employer’s stock. This can be dangerous for employees because, if employees devote a large portion of their portfolios to their own company’s shares, they risk compounding losses if the company performs poorly: first, in loss of compensation and job security, and second, in loss of retirement savings. An implication of familiarity bias is that investors hold suboptimal portfolios and suffer from under-diversification. Although the best practice is for portfolios to hold at least 300 stocks, the average investor only holds three or four. The average investor’s concentration in employer, large-capitalization, and domestic stocks work against the advantages of diversification. To overcome this bias, investors need to cast a wider net. Investors tend to hold onto a belief and then apply it as a subjective reference point for making future judgments. People often base their decisions on the first source of information to which they are exposed (such as an initial purchase price of a stock) and have difficulty adjusting their views to new information. The anchoring phenomenon can apply in a multitude of situations: The awards from lawsuits are often influenced by the plaintiff’s initial demand; in real estate, parties are unconsciously influenced by arbitrary posted prices. In the context of investing, investors can anchor around something like a stock’s purchase price or market index levels. In fact, round numbers (such as 5,000 points on the FTSE Index) often attract disproportionate interest. When investors exhibit this bias, they label an investment as good or bad based on its recent performance. As a result, they buy stocks after prices have risen expecting those increases to continue and ignore stocks when their prices are below their intrinsic values. People tend to think in terms of past experiences, arriving at results too quickly and with imprecise information. For example, if a company announces strong quarterly earnings, an investor with this bias might be quick to assume the next earnings announcement will be strong as well. Related to representativeness bias, the gambler’s fallacy lies in seeing patterns where none exist. Investors often want to impose a sense of order on things that are actually random. The phenomenon is named after gamblers who believe that a string of good luck will follow a string of bad luck in a casino. In another of his famous studies, Nobel Laureate Daniel Kahneman posed the following question: “Which of the following sequences is more likely to occur when a coin is tossed – HHHTTT or HTHTTH?” Most people erroneously believe that the second sequence is more likely because people regard HHHTTT to not be random. The human mind seeks patterns and is quick to perceive causality in events. In the context of investing, this bias can lend unfounded credibility to the claims of fund managers who have been successful for a few years in a row. It can also cause investors to perceive trends where none exist, and to take action on these erroneous impressions. According to traditional financial theory, buying and selling an investment should be two sides of the same coin. 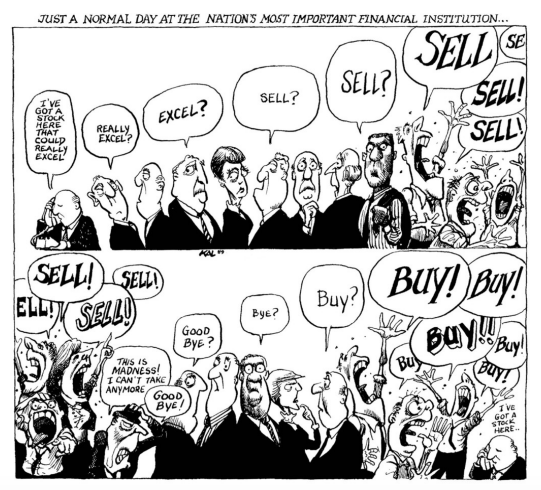 That is, in theory, investors observe the same signal when deciding to buy or sell. However, a 2006 study posits that individual investors are more likely to buy rather than sell those stocks that catch their attention (e.g., stocks in the news, stocks with high abnormal trading volume, or stocks with extreme one day returns). For example, when Maria Bartiromo mentions a stock during the Midday Call on CNBC, volume in the stock increases nearly fivefold minutes after the mention. This is because investment purchasing requires investors to sift through thousands of stocks, but investors are limited by how much information they can process. On the flip side, they don’t face the same problem when selling because they tend to only sell stocks they already own. This effect doesn’t apply as much to professional or institutional investors, who tend to devote more time to searching and utilize computers to perform analyses. Sometimes, the attention-attracting qualities of an investment may end up detracting from its utility. For example, a well-circulated article about a deserted vacation spot could attract the attention and the travel plans of vacationers, each of whom would be disappointed by the crowds of like-minded vacationers. Similarly, investors’ attention-based purchases could lead to disappointing returns. Economists have traditionally assumed that biases are universal, ignoring how other drivers might also shape financial decision-making. Up until this point in the article, we have primarily discussed psychological factors, which is more focused on the individual. However, there is growing evidence that preferences are also shaped by external factors such as society and culture. Cultural finance, an emerging research field, studies just this. Both behavioral finance and cultural finance reject traditional notions of pure rationality. This section delves into the differences in investing tendencies across global cultures, including differing levels of loss aversion, patience towards investments, approaches to portfolio management, and more. Perhaps the most famous definition of culture comes from Dutch sociologist Geert Hofstede, who dictates culture as a collective mental programming of the mind which is manifested in values and norms, but also in rituals and symbols. Hofstede breaks culture down into five dimensions (as seen below). Since cultures emphasize these dimensions to varying degrees, the following analysis examines how certain cultural dimensions and idiosyncrasies contribute to different investing tendencies. In 2010, Professors Dr. Mei Wang, Dr. Marc Oliver Rieger, and Dr. Thorsten Hens examined the time preferences, risk behavior, and behavioral biases of nearly 7,000 investors in over 50 countries. 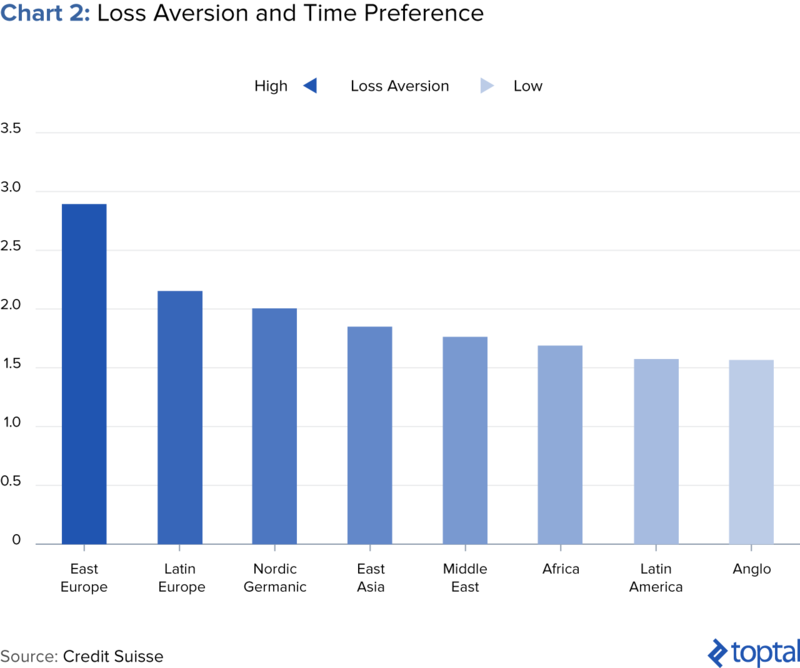 After controlling for factors such as national wealth and growth, they found that Anglo-Saxon countries are the most tolerant of loss, while investors in eastern Europe have the greatest loss aversion. In particular, they found that the cultural dimensions of individualism, power distance, and masculinity are significantly correlated with loss aversion. To further understand this finding, let’s examine individualism and its polar opposite, collectivism. In a collectivist society, such as East Asia, individuals identify themselves as part of larger social groups, whereas in an individualistic society, such as Western culture, personal values and achievements are more important. In individualistic cultures, self-enhancement and independence are emphasized, so people value and care more about an object (or investment) associated with themselves. In contrast, those from collectivistic cultures tend to adopt holistic perspectives on a single event, and are thus more able to cope with losses. They also receive more social support, which makes them less sensitive to losses. Another cultural dimension that affects investor loss aversion is the power distance index (PDI), which measures the distribution of power and wealth in a society. A country with high PDI tends to have a more rigid hierarchy, discourage assertiveness, and encourage suppression of emotion. Because the inequality is high, the average individual might feel more helpless and more pessimistic about the consequences of loss. Therefore, the higher the PDI, the higher the level of loss aversion. See below for a country-by-country breakdown. 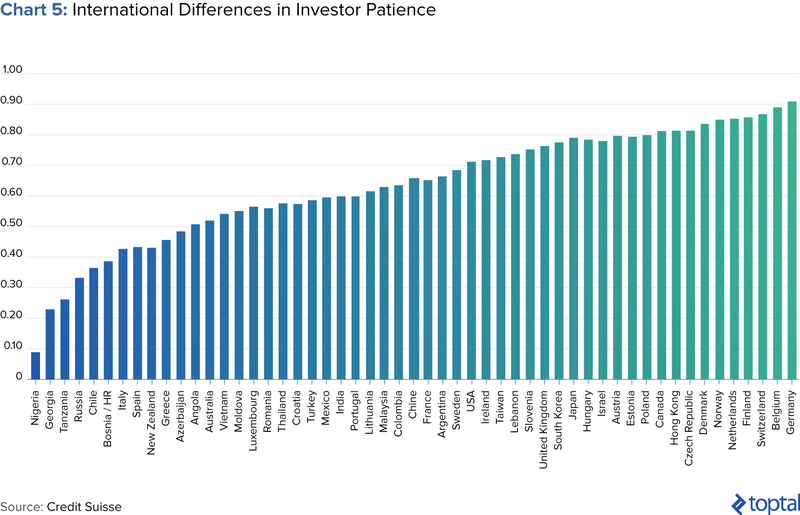 The results of the study demonstrate that investors in Nordic and German-speaking countries are the most patient, while African investors (33%) are the least patient. Those from Germanic/Nordic countries (85%), Anglo/American countries, Asian (66-68%), and Middle Eastern cultures are more willing to wait. The cultural dimension Uncertainty Avoidance (UAI) is a society’s tolerance for uncertainty and ambiguity, and can affect time preferences. Specifically, a society with a higher UAI score tends to be less tolerant to uncertain situations. Since the future is less predictable than the present, cultures with a higher uncertainty avoidance prefer immediate rewards rather than future rewards. Next, let’s examine long term orientation (LTO), another cultural dimension. People from cultures with high LTO, such as those in East Asia, tend to put higher value on the future and are more patient. Moreover, the dominant religions like Hinduism and Buddhism in Southeast Asia teaches the concept of “rebirth” and that the current life is only a small time interval of one’s entire existence. Therefore, Asians have been found to be more patient. In a 2012 study, academics Raj Aggarwal, Colm Kearney and Brian Lucey (2009) use Hofstede’s cultural dimensions to study foreign portfolio investment tendencies. They found that individualism, masculinity, and uncertainty avoidance are strongly related to cross-border investments. For example, individualism and masculinity are associated with more foreign diversification. On the other hand, uncertainty avoidance is associated with home bias, making investors more likely to buy and sell investments familiar to the investor. Countries with more UAI are less diversified in their foreign holdings. Interestingly, home bias is not as strong as investor sophistication increases. In a 2007 study of the United States, Germany, Japan, and Thailand, the study found that asset managers from uncertainty avoidant countries refrain from composing their portfolios as freely as they might be allowed to and try to compensate for uncertainty with intensive research efforts. An asset manager with more uncertainty avoidance might not deviate much from the market index. The study considered the difference between the tracking error that asset managers are allowed and the one they actually take a chance on. Of the countries studied, Japan had the highest uncertainty avoidance, while the US had the lowest level. The below figure shows that Japan had the highest difference between the allowed and actual tracking error level. In addition, asset managers from Japan spend the most time on explicit research (44-45% of working hours, on top of the highest absolute number of working hours) whereas those from the U.S. spend the smallest portion of their time on research (40%). While we cannot cure the behavioral biases we’re born with, we can certainly try to mitigate their effects. By employing systems intended to counteract these instincts, such as employing feedback, audit trails for decisions, and checklists, we can make more rational decisions and improve the chances of investment success. Whether you’re a personal investor, an investment manager, a financial planner, or a broker, you can benefit from understanding the driving forces behind investment decisions. In “The End of Behavioral Finance,” Professor Richard Thaler predicts that one day behavioral finance will no longer be as controversial as it once was; that one day, its ideas will become part of the mainstream. Eventually, individuals might wonder, “what kind of other finance is there?” At that point behavioral ideas will be routinely incorporated into models of economic and financial behavior. With the emergence of niche fields such as cultural finance and neuroeconomics within behavioral finance, we tend to agree. Behavioral finance is a new field that challenges the traditional assumption that individuals are rational. It focuses on the cognitive and emotional aspects of finance, drawing on psychology, sociology, and even biology to investigate true financial behavior. What is a behavioral bias? While our biases can serve us well in our lives, they can have the opposite effect with investing. Investing behavioral biases encompass both cognitive and emotional biases. Cognitive biases stem from statistical, information processing, or memory errors, and emotional biases stem from impulse or intuition.